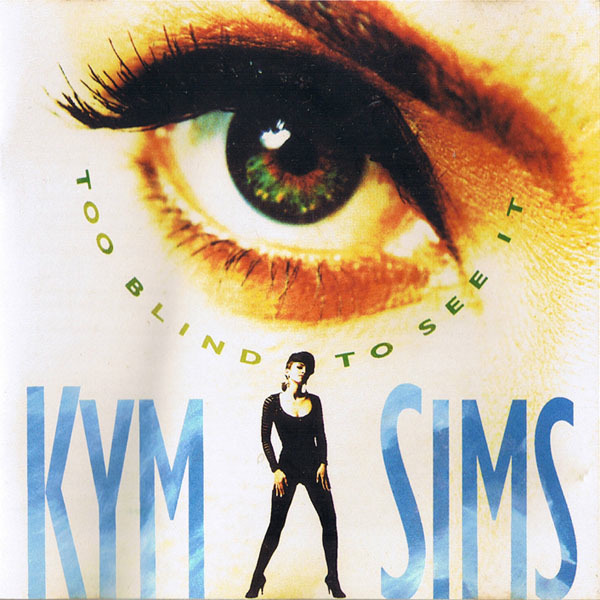 Today’s POP RESCUE is the 1992 debut album by Kym Sims – Too Blind To See It. If there’s one song that stands out in Kym’s career, then it’s the title track from this album – the infectious dance hit, Too Blind To See It. Laden with those catchy italia-house pianos, and fast beats, her vocals cut through them perfectly as she sings about a love lost. You can probably take her vocals and play them through any track really. I’m pretty sure that there’s plenty of DJs and remixers who have done just that in the past. Her second single, Take My Advice was a hit too, but not as big. It’s the second track here, and it’s the ideal follow up. Sadly by the time her third single, and third album track, A Little Bit More, came out, pop had moved on again and left her behind. A Little Bit More musically (and to some degree, vocally) reminds me a LOT of Dannii Minogue’s 1991 track Baby Love (compare Kym to Dannii). But then, Steve ‘Silk’ Hurley was behind both tracks, so it’s of no real surprise. Take Me To The Groove is a catchy, light track, again with those bouncy pianos. It fits in here perfectly. One Look and I Found Love are two standard early-90s pop tracks, with One Look being a stronger track. Shoulda Known Better is pretty much along the same route, but the ballad In My Eyes is not a good track. It feels particularly dated, and like something that’s fallen off a Mariah Carey album. Kym needed to stick to up-beat pop/dance tracks. Whilst she can sing a ballad, her voice is much better suited elsewhere. Thankfully Never Should Have Let You Go is at least a return to the right direction again. Including reminiscent synth riffs from Too Blind To See It, but this does feel like a filler track. I Can’t Stop is a much stronger track ‘I need, I need, I need your love. I just can’t stop‘ she sings, over what is very much the little 3-note signature intro of Summer Breeze by The Isley Brothers. Problem is, she’ll have to stop, as the only remaining track is Too Blind To See It (Soul Mix). I’m not sure what’s going on in the chorus section of this ‘soul mix’ – it’s a bit messy – but Kym’s vocals are pitched against some delicious beats in the verses and that combination sounds great. Essentially, this album starts off fantastic, goes a bit flat for a few tracks in the middle before one final spurt before it’s done. Where is Kym Sims Now? Kym has continued writing, recording and releasing occasional singles, but she has yet to reclaim her debut success. Kym also wrote the hit Keep On Walkin’ for Ce Ce Peniston. Posted in 1990s, Kym SimsTagged 1992, A Little Bit More, album, Kim Sims, review, Steve Silk Hurley, Take My Advice, Too Blind To See ItBookmark the permalink. That’s great to hear that Kym is still releasing – we’d love for her to score some more big UK hits. We’ll hunt down those new tracks. Hey all thank you for keeping me in your thoughts… I’m keeping it moving… Still recording and happy to be a force in 2015! Keep showing me love!! !